Ingest and Aggregate video, text, audio and pictures into our cloud-based DAM and Metadata Management, supporting search and access from any device. Secure sharing of files with date and time stamps that control when and for how long content will be available. Built in CRM for tracking all B2B activities. Paywalls to support immediate request for content. On Demand "New Product". Instantaneously search content based on tags, then package and distribute the content to multiple channel opportunities. Built in Ad Insertion on all media. Dynamic Ad placement from all major ad networks and turnkey subscriber portals supporting B2C activities. Explore our "Digital Ecosystem" and understand how our modules support, manage and deliver immediate ROI. We are the "Digital Habitat" for all your content! Single solution for "ingesting, tagging, transforming, distributing and monetizing your content"
We are device agnostic allowing you to search, distribute and share you content from any device to any device. Why should I use Digazi? Our solutions provide content owners, creators and distributors with a solution that addresses content lifecycle management from ideation to creation, distribution and monetization via a single easy to use interface. Can I access content from any device? DIGAZI will provide as part of its solution via a built in mobile app with access to upload, share, manage and distribute content. Our mobile App will be available to your customers on Google Play, Apple Store, and Windows App Store. Do you support print text and multiple eBook Readers? Integrated into Digazi is a digital publishing solution supporting, PDF to Flash and HTML5 supporting iPad, IPhone, Android, PC, Mac, Tablet and Desktop. Can you ingest files from any device or any other cloud based store? Digazi will allow a user to ingest a single or multiple media assets via any device. 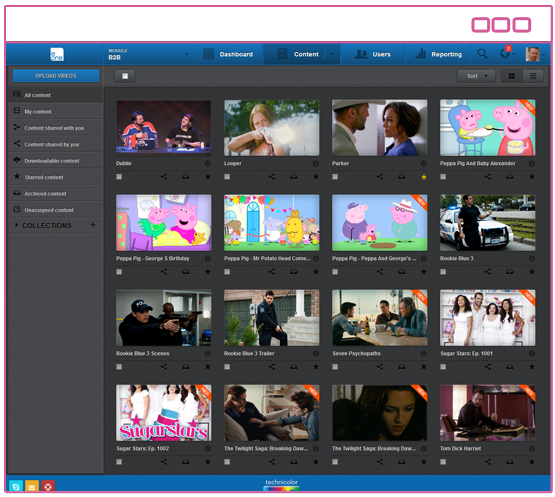 Our built in desktop loader supports bulk ingest and tagging of content. Our APIs will automatically pull content in from any cloud media store including Icloud and Google Drive. Please contact us for additional options. How does a user choose the video format in which they would like the content delivered? Video encoding allows you to seamlessly integrate your encoding jobs through our API. With your video stored, using our API Builder, you can create an encoding job request that will direct DIGAZI to the location of your video, indicate how DIGAZI should encode the video, and point to where DIGAZI should house the resulting output video. Although today DIGAZI is managed completely using Amazon Web services, we are Infrastructure agnostic and clients can choose to port our software to their own private/public cloud infrastructure or choose to install on their private networks. Our cloud-based solutions gives businesses and web application developers an easy and cost effective way to distribute content with low latency and high data transfer speeds.